The student services office at each campus maintains a list of boarding accommodations available. Students attending College of the North Atlantic in St. John’s can apply to stay at Memorial University residence by calling 709-864-7590. Students attending College of the North Atlantic in Corner Brook can apply to stay at Grenfell residence by calling 709-637-6266. 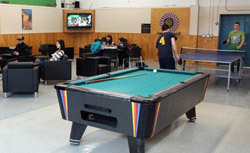 The college maintains residence facilities at the Bay St. George, Burin and Happy Valley-Goose Bay campuses. Students wishing to apply for residence should contact the campuses listed below to obtain an application and should apply directly to the residence office of the appropriate campus. Residence space is limited and therefore the college cannot guarantee a room to everyone who applies. All applications are processed on a first-come, first-served basis only after a student has been confirmed in a program at the college. For more information please contact the campuses above or call 1-888-982-2268.